Forum Index > Off-topic Talk > Replica or authentic? Posted: Fri 01 Feb, 2008 11:53 pm Post subject: Replica or authentic? I want to aquire a sword for training techniques and horseriding. I ride a lot at night and encounter a lot of feral dogs and boar. The boar are easy to avoid but the dogs need to be confronted sometimes as they will only give chase and attack when you try to run. Sofar I have been riding with a long stick but that is a bit of a clumsy thing. There is no way I will stand much of a chance to harm them with a sword as one needs a lance for that but I do want something functional. 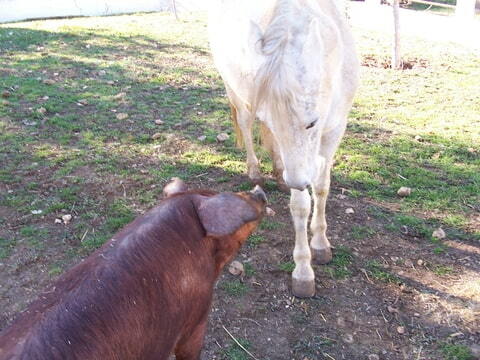 They are quite clever enough to get the mesage from live steel. I know a whip would do the job but I am not handy enough with that, my horses take fright and dense growth leaves too limited space. I will not hammer away at bottles or trees; I am not interested in cutting things. The price of decent functional repros is about on par with serviceable authentic swords and I have set apart a budget for someting nice but not silly as it MUST be reliable and functiobal above all: p.e. A&A is no problem. The basic question is wether it is acceptable to carry an antique that took say two centuries to be what it is on the rough and tumble of nightly cross country rides. I would hesitate to use an antique unless it was 100% serviceable and common enough that if something bad happened to it it would not be to a unique piece. A very interesting question from a practical point of view and I assume that period is not a high priority but I would go for a medieval riding sword or an early complex hilt " rapier " with a good wide blade. ( Lets avoid the what is a rapier discussion, at least for this Topic maybe. ). There may be a lot of possibilities out there that others might suggest but I'll limit my suggestions to A & A as they are a know quantity as far as quality is concerned. A fairly long blade to be able to reach a feral dog without having to bend down too much: So I don't think the A & A Falchion would be a good idea from horseback but would be great on foot. Hopefully you wouldn't need to actually use one of these on a feral dog but should you have to I would think you would want to be able to cut it in half before it bit you or your horse ! Even more so if the dogs attack in packs ! So I would choose the heavier blades myself. Personally, I'd get a firearm. Wild boar are nothing to fool around with. Buenas Jean, thanks for thinking about it. The type of sword you are thinking of is spot on although it will not be actually necessary to ' engage' . Yes, dog do 'attack' in a pack but always with one more daring dog testing the water. Confronting and possibly pinching this one is quite enough to face off any risk. Trying to avoid or worse, flee, simply encourages the pack. I realy do not need all that much but would like someting more than my riding stick that I currently point at the daredog. A longish blade from the Louis XV period would do. 'Period' nor region is an issue. I have absolutely no qualms about Taichi Yang-style exersizes with a smallsword p.e. The crux is indeed wether it is acceptable to risk bending/damaging an antique in the light of it being meant to be used.... I will not be using a museum piece as that is beyond my budget so why NOT? It somehow 'FEELS' incorrect but why? Is it an associative perception of ' sacriledge' whereas there is actualy nothing wrong with it or what? I mean; what is wrong with fun track use of a classic racing car? Is it ' better' garaged in a private collecting where it is of no use and nobody ever gets to see it? The type of sword you are thinking of is spot on although it will not be actually necessary to ' engage' . Yes, dog do 'attack' in a pack but always with one more daring dog testing the water. The threath may be enough but it's always good to be ready to back up a " bluff " with action if the bluff fails, so the sword should be as effective as possible. You might run into the rare dog who is either too brave/agressive or too stupid/hungry to back down ? The firearm option is obviously a good one if legal ! But I am answering the question as asked. Well, if the antique is serviceable one could look at it as using it as it was intended and not as abuse: Extended service life for the sword then. Oh, Craig at A & A could customised a small sword with a slightly wider and sharper blade ? In fact boar are so much so that a firearm would need to be quite seriously effective and then some as a hit but not dead boar is quite a bit more dangerous than it was to start with. Better to steer clear of them which is simple enough. They will not attack if given even half a chance of a retreat. Feral dogs in a pack behave completely different. Nothing dramatic however; I can quite manage with the simple riding stick but would manage better (and feel safer) with something more functional. I don't want to cut up a dog, if fact want NOT to and only want to descourage them from biting my horse. Sofar the stick has been intimidating enough but if one night a dog calls my bluff is pretty useless IF push comes to shove. I still would not want to seriously hurt the critter though as it is only trying to survive after all. Some wheeks ago I was attacked by a single dog which was so out of the ordinairy I decided to outrun as I was near a large cortijo with chained guard dogs. The dog behaved atypical and rabies did cross my mind even though it probably was not. This is an illustration of why I do only do dismounted training session at night with my stallion. There is not a serious problem at all but there ARE feral dog packs that I DO encounter. If you want to use an antique blade take a look at the British 1908 pattern cavalry sabre. It is widely known as the most effective cavalry sword design wise. It is light has a large effective guard and has a metal scabbard which is a good weapon on its own. It is not too old to be problematical as regards strength and was made by some of the best sword manufacturers in the world, Wilkinson, Mole etc. It is a thrusting weapon rather than a slashing type which in my opinion would be much more effective when confronting a snarling dog although it does have the capability for cutting the last 18 inches of the blade being the recommended section for sharpening. Although not the cheapest sword on the market I think the basic design would suit your requirements. So let me get this straight: on your spare time you like to go out riding at night, getting chased by wild dogs and the occasional boar? And now you want to get a sword so you can defend yourself? Damn, that's sorta awesome. I mean, I consider myself a friend of animals but I have to admire your adventurous spirit non the less. Anyway, if you just want something to scare off the lead dog, I think Jean was on the right track: something light but with a bit of a bite and with the range to attack from horseback would probably be ideal. No need to crack the poor thing's head open, after all. The 1908 pattern sabre seems to be a nice idea to me too or maybe any sabre or shashka from around 1850-1945. If it has as little decoration as possible than its more likely to be meant for military use. What about dog whistles? Do they harm the horse too? If not, I think it would be a nice first line of defence because of its range and effect on multiple dogs simultaneously. Buenas Anders. Like I wrote I prefer to NOT harm them and have THEM not harm my Horse. Night riding through the country is something special; everything is different and your sensual perception is too. The mountain air is relatively clear and there is little light pollution so the stars are awsome. Where we live after 23.00 there is NOBODY out in the countryside. Exactly that means the animals have adapted too and the countryside comes to life as the rural population goes asleep. As you can read under 'the reward' on my website the nightriding is simply unbeleivably rich. The crux is not to excite the dogs into agression wether agressive or defensive but every so often we need to assert ourselves. As these are feral dogs they are not all that scared of man to begin with and loose about all of their shyness at night when they are accustomed to masters of the countryside. The mentioned dog wistle is a good idea BUT indeed woul my horse shy too and I doubt that the dogs would be impressed and might just as easily react with agression. Again, it is not a 'problem' but serious enough reason not to take my own dogs along and not go unmounted with my mares. The feral dogs are (not just considered) a pest and there is a ' perrero' employed by the ayuntamiento who shoots them as do the hunters. Officially it is illegal to carry a long blade but nobody will make a problem of it even in the highly unlikely situation of encountering somebody let alone a lawman. Furthermore I am acqainted with the local gae keepers and local civiles. Them, the dogs , being a pest is however not their fault so I prefer to leave them be and the areas which I know them to fequent I pass through humming, singing softly or if the ground permits at a trot so they can hear me. My horses are accustomed to boar http://www.mijnalbum.nl/Foto-3AYI4I3K.jpg so do not scare which makes it easier to retreat in a controlled manner. 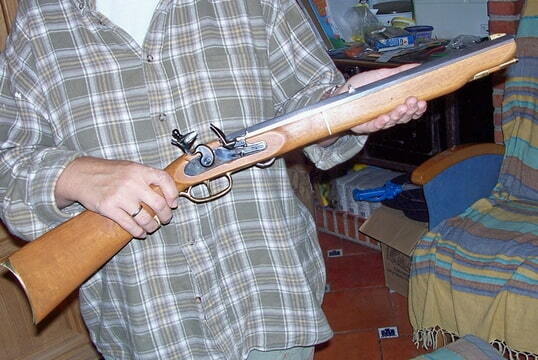 I do have a DIY flintlock saddlegun http://www.mijnalbum.nl/Foto-B6ROPMGX.jpg that I could carry in a holster I made for it but that, doing harm, is what I do NOT want. I have two nice spears too but that is most definitely a clumsy NoNo for nightly crosscountry (terrain) rides. and learn to use a reliable handgun. knowing all your conditions, this is just something of a gut reaction. And the LAST thing I'd think you'd want to risk is being attacked by a pack of wild dogs. want to face a pack of " domesticated " dogs with just a handful of steel. Wild boars depend largely on where you live. For the most part, boars of in north america are perfectly willing to ignore you as long a you are willing to ignore them while the ones in europe tend to be a bit more aggressive. However, the ones in california are particularly aggressive(and in many areas are considered a pest...a very dangerous one at that) as they have been transplanted from europe and through agression, basically replaced the boar population here. So they have generation of agression built in them. However, none of this matter if you run into a nursing sow as the initial charge is likely to be either fatal or incapacitate your horse for an ability to flee. Normally, you can see the boar, it can see you and everything is good...but nursing sows hide a bit to protect the young, so you are likely to surprise each other is this case. So basically, yeah, forget the sword, carry a .357 magnum or better. When we asked our local gaming commsion about the legal ramification of killing a boar with a spear or sword, the offical basically laughed...then asked if we were serious...then told us it's self defense...and told us we were bloody loons(and he highly recommended we cary a .357 mag side arm...but if we did, we'd have to get a tag). In much of Europe it is impossible to carry firearms in the open and to be fair, one's choice as to where they ride their horse is largely determined by where they live. It would be frustrating to load your horse into a carrier every night and drive to another location to ride. I imagine he rides just around the area where he lives/the horse is stabled. Ride my hourse somewhere else. The goal is to ride into the mountains to enjoy the stunning nightly nature of it. Riding ' somewhere else' would bring other risks even during the daytime unless you stay in the dressage ring. I have a round pen next to the house but that is not my idea of fun nor -riding. possible charge of an enraged boar when none of that is your intention ? Because the experience of riding where I ride is SO rewarding, my goal in horseriding; being able to ride anywhere anytime and completely enjoy the scenery. No need to correct that; it's what I already wrote three times. I furthermore prepared my horses not to take fright in case. I do not ' want' that either yet have been there done that even on foot without even the riding stick. It is not a 'problem' as I prepaired my horses for this too but it is not inconcieveable that my simple stick one day may not be enough. I ride off road yet usually have a red LED light attached to the crupper. I do not ride when the neighbours are out hunting wild boar yet usually wear a safety jacket or strap it behind the pommel. So; that can be closed I guess. Take this http://www.zheng-wu.com/jian/IronjianQing.htm sword p.e. With a sanmai blade it would be about the same price as an original 200 year old one. The type of sword is just an example and the same applies to other types too. It is not like I am going to use a classic racer for commuting as I will not be clobbering things with the sword and I will benefit from any plus in balance the original may have when excersizing yet riding around with it does put it at all the risks of the real world. It would be frustrating to load your horse into a carrier every night and drive to another location to ride. Well, and talking about risks... Any idea of the compound risk of THAT? Yes, I ride where we live. 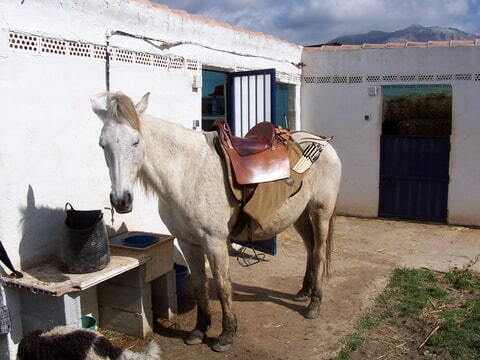 I call the horse I want, put the corresponding saddle on and go into the countryside straight off the yard. I sometimes take a bow along http://www.mijnalbum.nl/Foto-VIG3FBFU.jpg but at night that would be a waste of arrows besides very unnice to the dogs. Did you ever end up ordering anything from G.G. Godwin? It sounds like you ride in country I was raised in. I grew up in Southeastern Idaho about 1400 to 1600 meters above sea level. I used to love hiking and riding my dirt bike in the mountains in the bright moonlight. I would turn off my headlights and drive by moonlight, too. It's hard for people to envision this type of thing unless they've experienced it. Have you ever sat by a clear stream in the middle of the night watching the trout rise to night hatches? Now, to get back on topic, I'd like to share my opinion with you. Have you looked at Albion's Liechtenhauer or their I:33 in the Maestro line? They're not out of your budget, they're not sharpened-although serious injury could be inflicted if you had no other choice-so you could cause enough "concern" in a feral dog's mind to perhaps break off an attack. I assume you use an English style saddle so you would have to come up with some kind of scabbard. With a Western (Cowboy) style you could use a rifle scabbard. Might want to think about the Liechtenhauer since it has a long blade and a rearing , prancing horse might make a shorter one somewhat ineffective. It weighs about 1.8 kilos but its balance is nearly perfect. I have no problem wielding it single-handed. I don't know anything about wild boars, so I wont be much assistance to you there. Enjoy your night rides! It's a kind of paradise on earth. I'd like to point out that Peter has the right to ride his horse where and when he wants as long as he is obeying the local laws. Feral dogs are essentially vermin and dangerous to wildlife and the environment, through predation and disease, as well as people. I can't believe the suggestions that Peter should for all intents and purposes run away; he's not looking for trouble, he just wants to enjoy his horse and the night. I have frequently hiked at night and enjoyed it tremendously, except for the mosquitos. The outdoors is different at night and quite beautiful. I and some friends once chased a pack of dogs off a deer that had been shot out of season. We were unable to save the deer. While a sword might be more aesthetically pleasing, I'd consider a sturdy stick because there seems less chance of hurting the horse and also it is easily deniable. Why is deniability a factor? Well, in the upper Midwest, a lot of "wild dogs" were farm dogs that liked to pack up and run deer. Its pretty hard to trace a stick if someone wants to sue you for hurting Flossie while she was trying to hamstring your horse. It sounds like things might be more sane in the Andalusian mountains than they are these days in the U.S. so deniability might not be an issue for Peter. 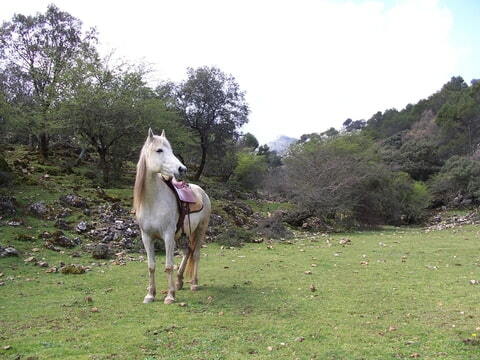 It sounds like things might be more sane in the Andalusian mountains than they are these days in the U.S.
Flossy is no problem anyway. Dogs are supposed to be kept in check by their owner over here and also my horses know how to deal with a mutt even if it comes rottweiler size. No mosquito problems here at night either, NONE. 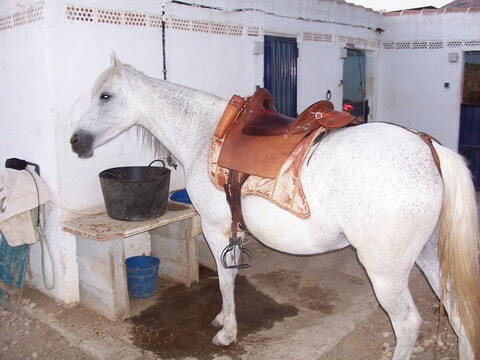 @RD: I have given various links to fotos; they may interest you and also show the saddle type I use. A scabbard is no problem. If it does not come with one I will make it myself. They are accustomed to me waving/thowing spears, shooting arrows, trained in dealing with agressive dogs and are relaxed with boar. It is a valid remark that sharpness is not a priority: I want NOT to cut the dog in half, just give it somethng more to take into account than my riding thingamy. It is a bit doubtfull however if carrying a sword along is REALY justified by the purpose. The dogs are real enough but my horse(s) will chase a dog I point her/him at like a greyhound after a hare and I have both hands free to do threatening things with my riding stick. I guess the sword is simply a confidence booster. As you will or may have seen on the fotos I ride unbridled and confidence is a big thing: all I have is the horse's confidence in my decisions. Wether I will take a blade with me on specific nightly trips and treks thus is no issue: I will and it must be NICE. The issue is wether it will be authentic or replica.